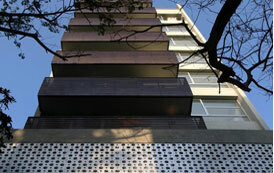 Located in Bandra, Mumbai, St. Leo apartment is a seven-unit building in a historic neighbourhood. Each apartment occupies an entire floor and has a split level, giving variety in space and views. 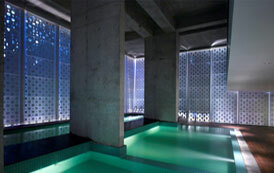 The lower levels house a private club with a swimming pool in a double-height space. On the roof terrace, a cantilevered sunshade covers a private swimming pool for the penthouse apartment. The ground level is sheltered by a cantilevered curved canopy. The lobby is open-air and connects to a front garden with a reflecting pool and outdoor deck. 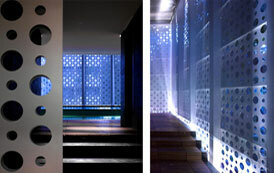 The private club levels above are clad in a custom perforated metal screen. Every apartment has three bedrooms, a study, and a generous living/dining area. Each space is carefully designed for an integration of furniture, cabinetry and views.